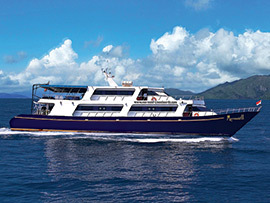 The Mermaid 2 liveaboard is a top quality steel hull boat, operating in Asia for just over 10 years. She is one of the best boats in the area. During 2013 - 2014, Mermaid 2 will have trips in Komodo and Raja Ampat. There's a special offer been announced for all trips in June and July, with a 10% discount on all available spaces.